Combining numerous unique assets, nanodiamonds are promising nanoparticles for biomedical applications. The present chapter focuses on the current knowledge of their properties. It shows how the control of their surface chemistry governs their colloidal behavior. This allows a fine tuning of their surface charge. Developments of bioapplications using nanodiamonds are summarized and further promising challenges for biomedicine are discussed. J.C. Arnault would like to thank H. A. Girard, T. Petit, M. Kurzyp, C. Gesset, C. Sicard-Roselli, E. Brun and M. Mermoux for fruitful discussions. He also acknowledges the different coworkers which contribute to studies dealing with surface modified nanodiamonds. 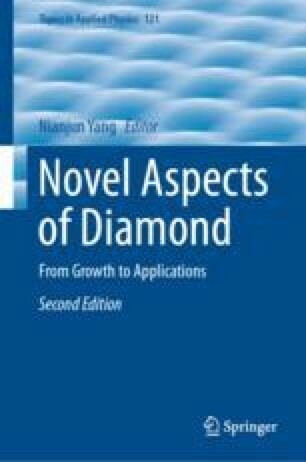 The author also thanks Professor E. Osawa for providing detonation nanodiamonds.